Tabdoq is a young brand of tablet holders by Tabletpro. These tablet holders are used at trade fairs and in EPOS till systems to make the tablet more long-lasting and durable. That enables this product, originally designed for consumer use, to be used in the professional market as well. Customers of Tabletpro include, for example, Carglass, Opel and the Van Gogh Museum. New tablets are currently being rolled out at a high rate. This has given rise to a marked proliferation of diverse tablet holders. Tabletpro therefore asked Kommerkors to develop a universal tablet holder that could easily be adapted to the latest tablet formats. 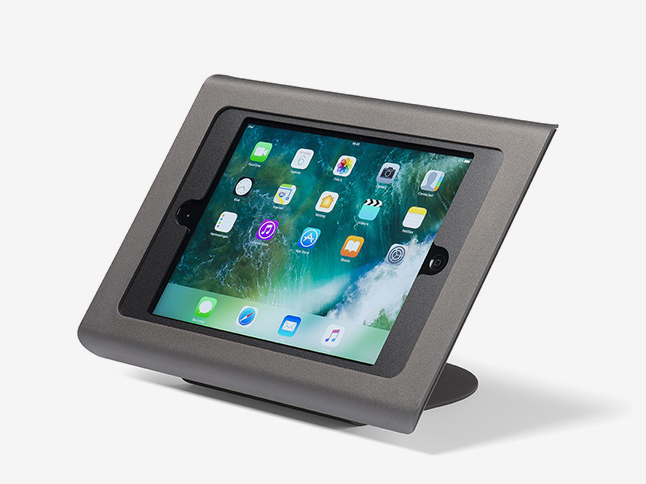 Kommerkors designed a tablet holder with a standard metal base frame that can be produced in large numbers. An accompanying mounting cut-out can then be made in smaller numbers to the right size. As a result, Tabletpro is now in a position to deliver a suitable tablet holder within a few weeks of the introduction of a new tablet.